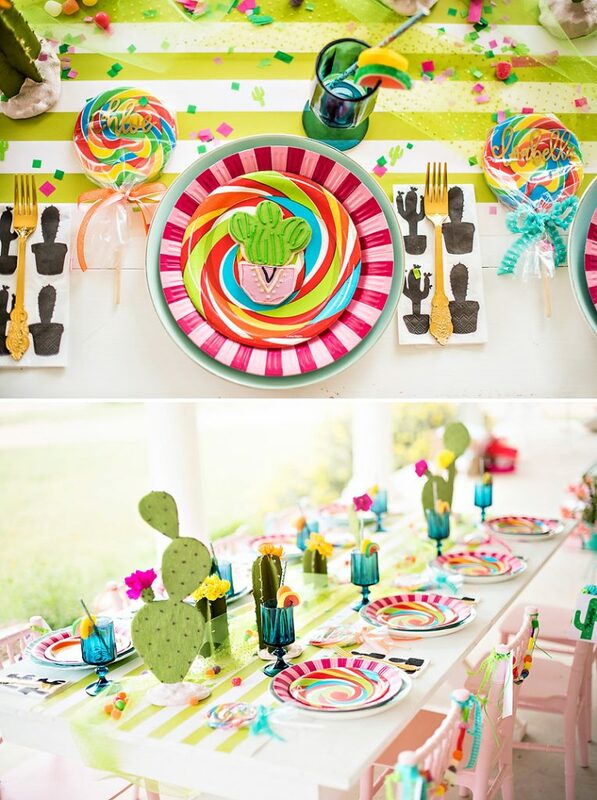 The lollipop swirl plate was one of the strongest sources of inspiration for us! Large novelty lollipops served as creative place cards, and were hand lettered in gold by Fritztown Lettering. Since we rent vintage dishes as part of our business, we needed a (non-breakable!) 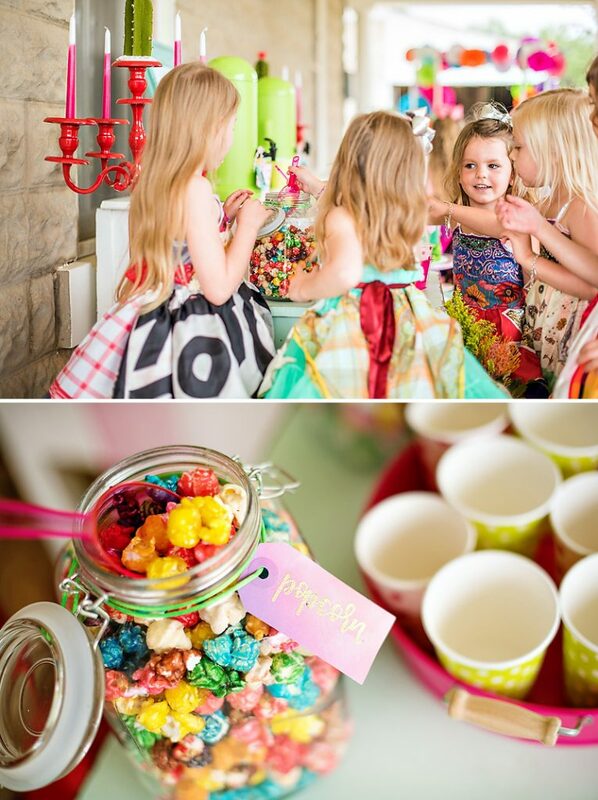 workaround for kid’s parties. We chose boutique quality paper goods, which are a also a great way to add trendy style to real china or glass vintage ware. Vintage aqua rimmed plates were used as chargers, while 2 different patterned paper plates were layered on top. Gold plastic flatware was another a practical way to elevate the look of the party, while black and white cacti napkins added a modern touch. 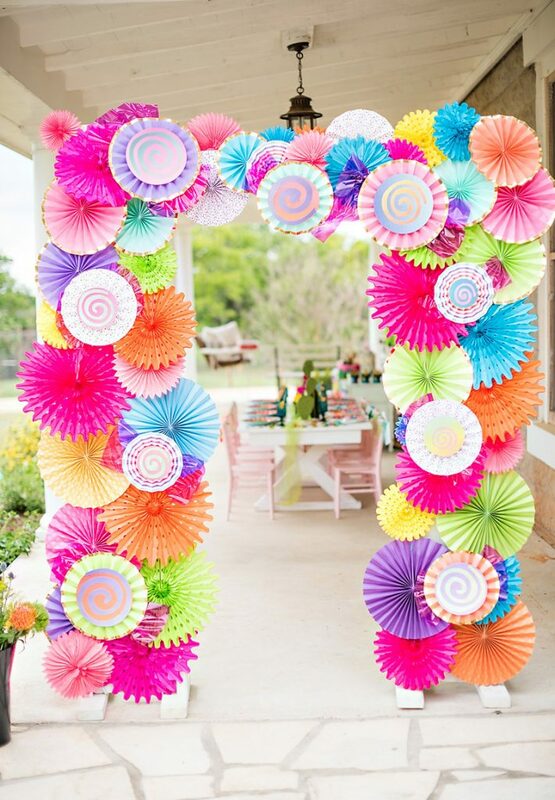 One of the highlights of the party was the brilliantly colorful paper candy-pinwheel arch… what a great photo backdrop! The girls all felt like a queen when they walked through it, too. Layers of tissue pinwheels, cardstock pinwheels, and paper pinwheels made this arch into a textural dream. We even hot glued paper swirls to the middle and cellophane to the ends of some of the pinwheels to make them look like giant pieces of candy in a wrapper. 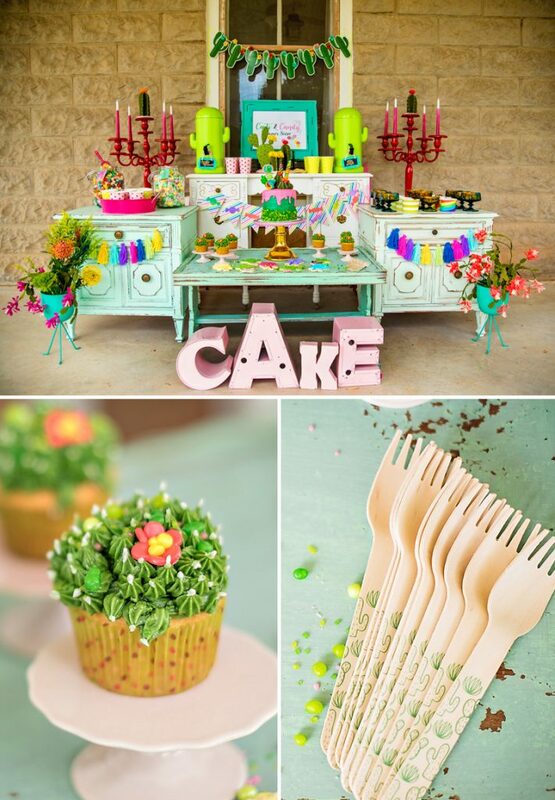 The cactus cake and cupcakes were created by Funny Farm Bakery, and the cacti on top are very lifelike! The bottom of the cake is rimmed with Candyfetti from my favorite candy company, Sweets Indeed. This particular mix is actually named Cactus and has various shades of green candies. Sweets Indeed also makes the Candy Kabobs that went on top of the cake. 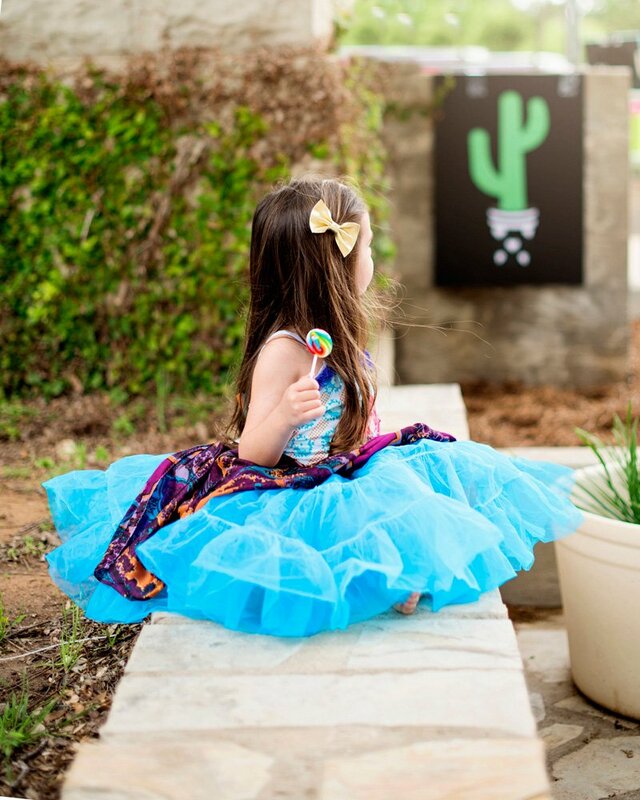 The layers of sour gummy candy are topped off with a wheel of sour belts with a cacti accent. These are so fun to eat and weigh a ton! 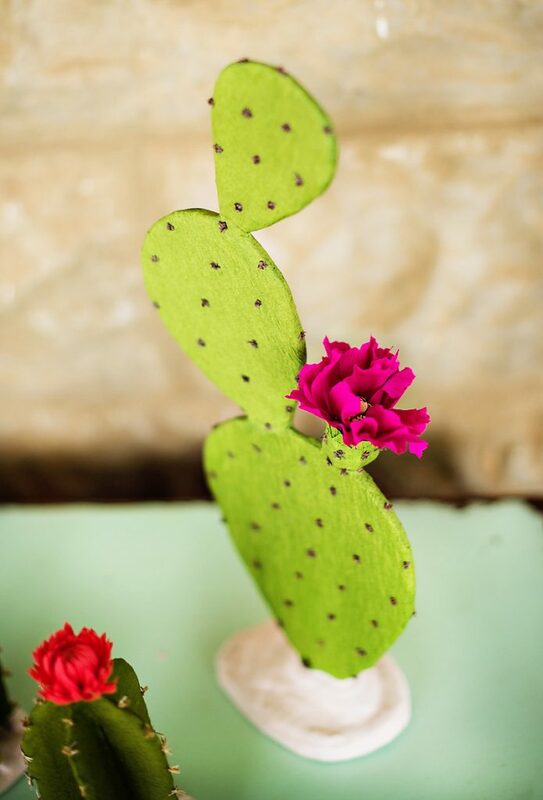 Another special feature was the array of handmade paper cacti that ran down the center of the table. Nectar Hollow (the maker) really outdid herself! 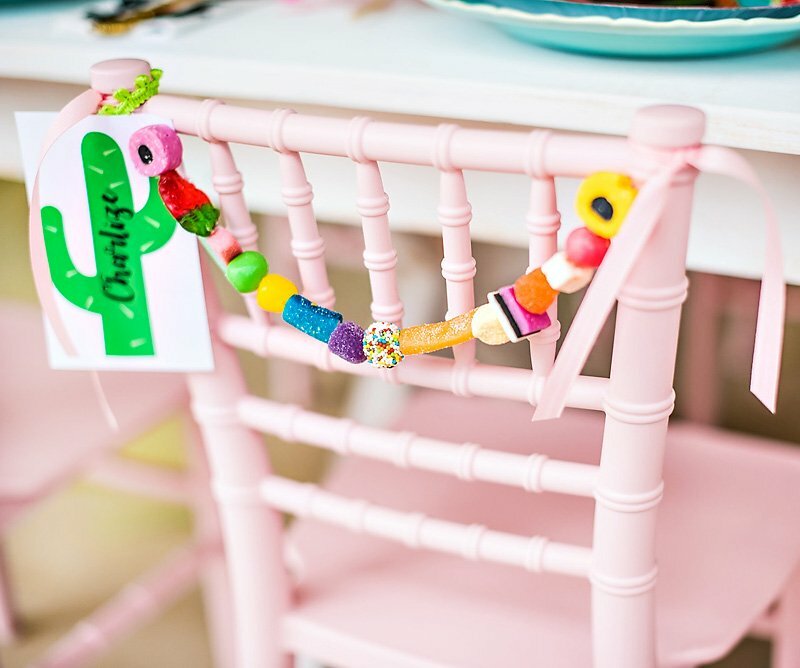 These paper cacti added a bright airiness to the design, while making it possible for us to have cacti on the table that were realistic looking AND kid-friendly! 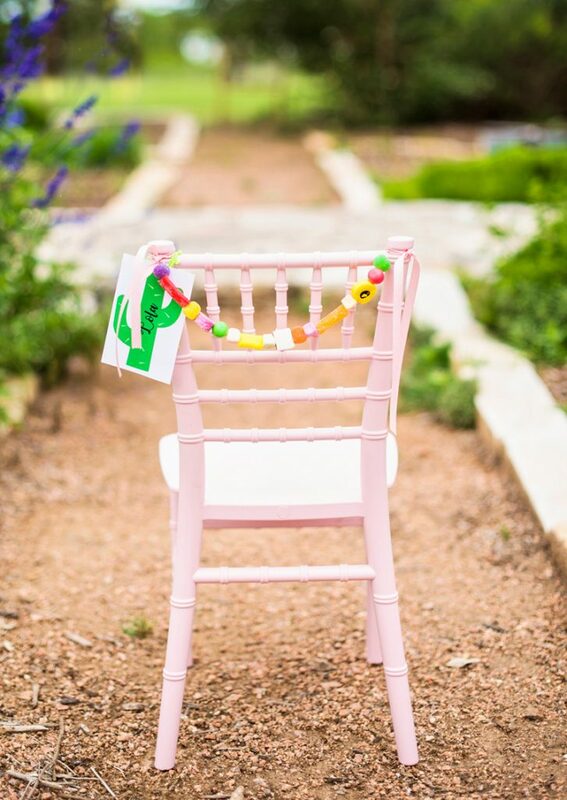 This whimsical Cacti & Candy Summer Soiree styled shoot showcases how vibrant and friendly the local abundance of cacti is here in Fredericksburg, Texas and also allows all the colors of candy to be given their time to shine! Layers upon layers are what make this table such a scrumptiously delicious treat for the eyes! 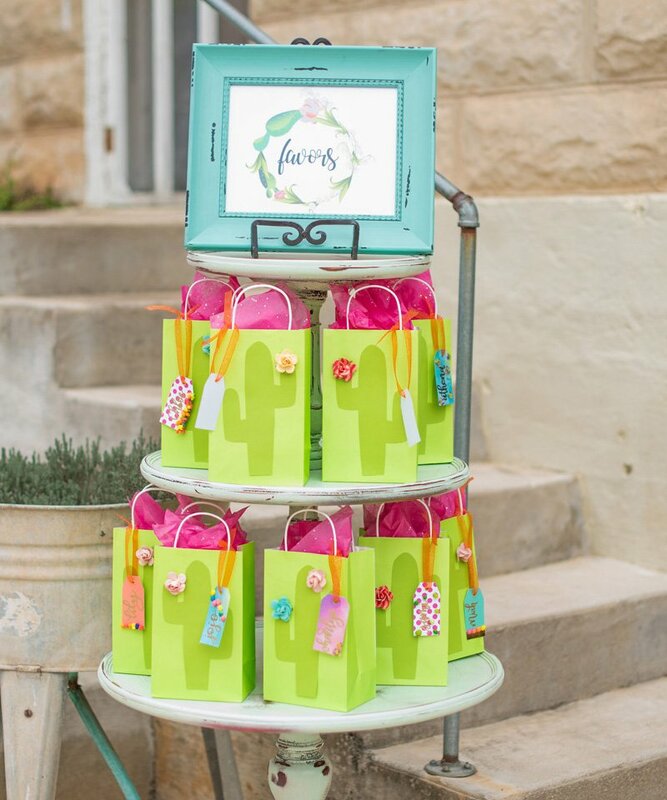 A lime green stripe paper table runner was used as the base, with tulle in various shades of green woven throughout. 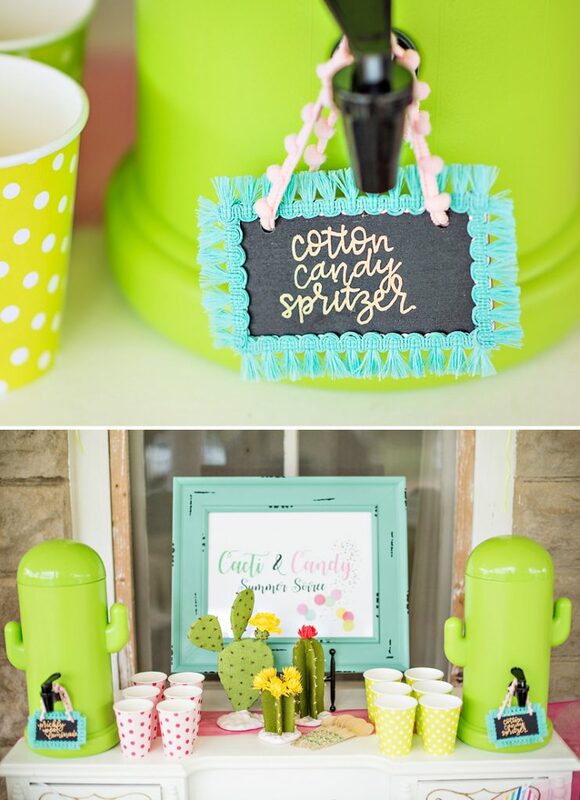 Hand cut confetti with glittered cacti silhouettes was sprinkled on top. 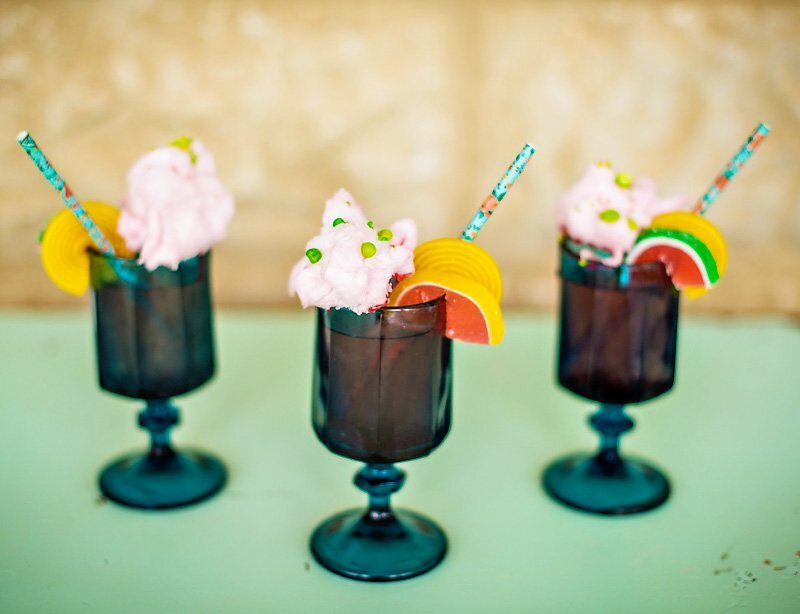 I especially loved the vintage teal glasses with candy fruit slices on the rim! Ruby Pearl Clothing hand dyes and makes the most unique and whimsical dresses from vintage scarves and beaded details. 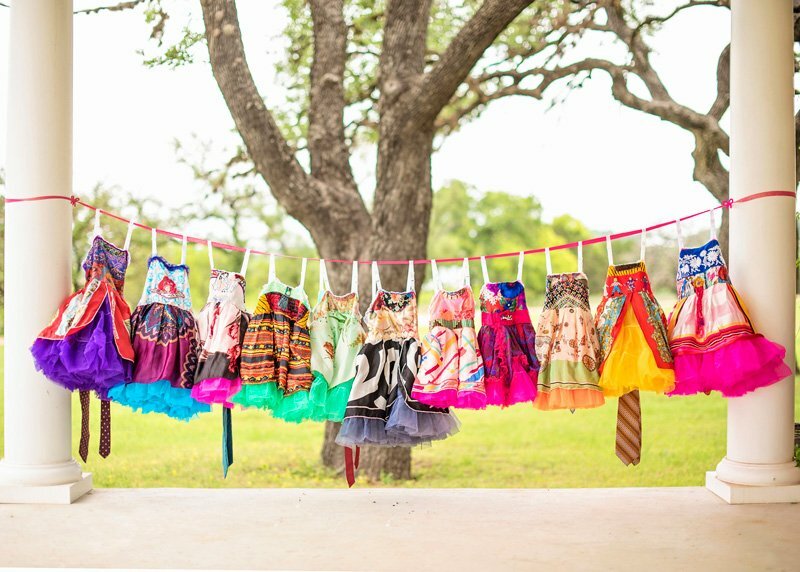 Every girl can feel special because her dress will be uniquely hers. In addition to the amazing cake (described in #4, above), the dessert bar housed lots of smaller goodies. 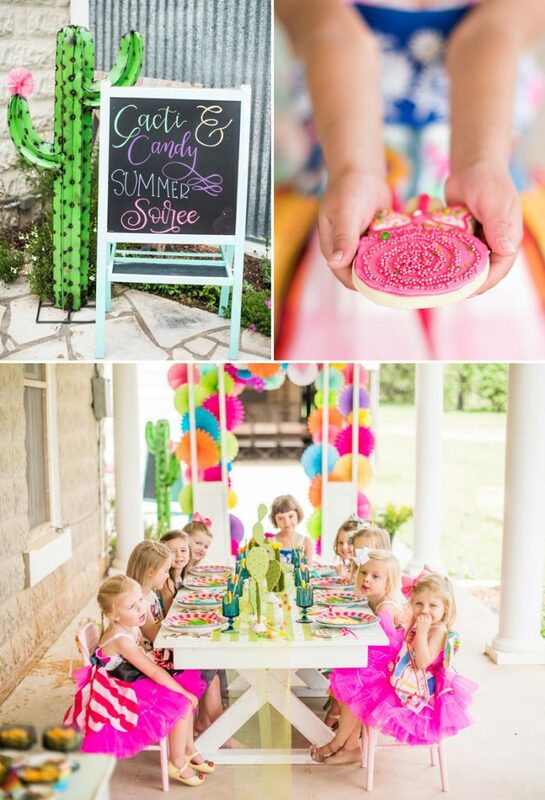 Campell’s cookies made the colorful lollipop and cacti shaped cookies. Each one was a little bit different, and the ornate pots for the cacti are such a great detail! 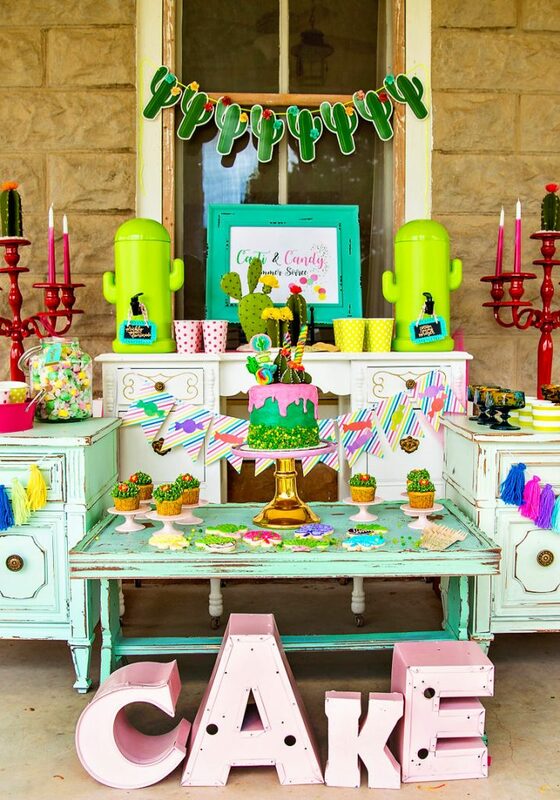 The other treats include Cornfetti popcorn and taffy from Just Pop-N, cacti shaped suckers, and 2 fun drinks appropriately named Cotton Candy Spritzer and Prickly Pear Lemonade. The Cotton Candy Spritzer got a heavy dollop of cotton candy and sprinkling of Candyfetti on top. The festive cacti shaped drink dispensers came from Oriental Trading Co. The bamboo forks and spoons came from The Sucre Shop, and they have the most perfect little cacti outlines on them. 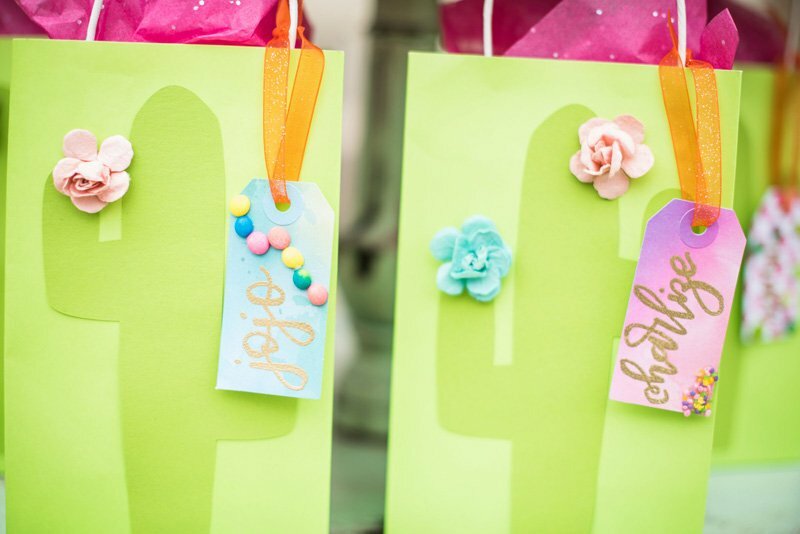 Handmade details are incorporated throughout, ranging from several different paper banners, paper flowers, hand lettered signs, custom iced treats, and custom designed signs. 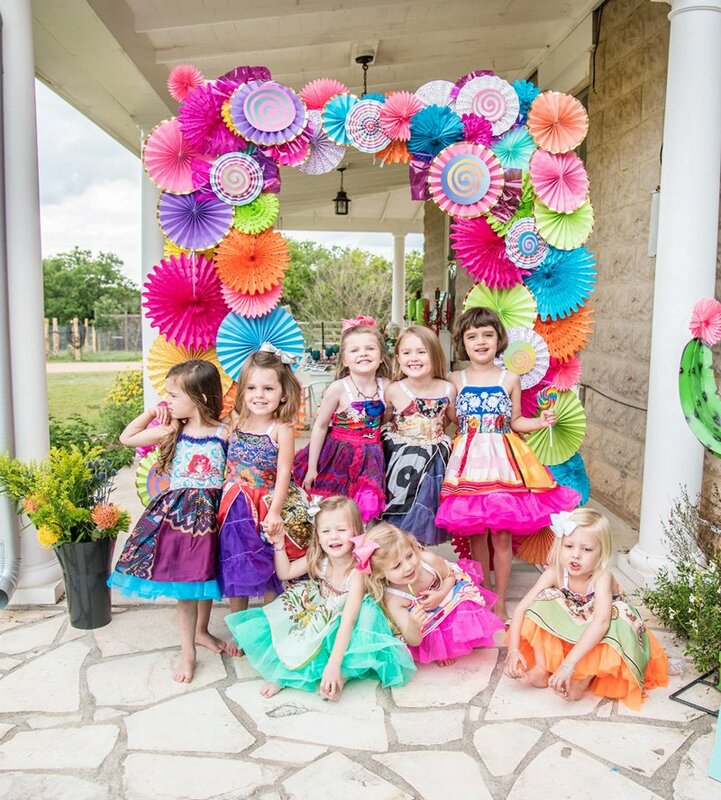 We specialize in paper banners and other handmade details, so when brides or moms rent from us, we like to create something unique for each client! We had 2 paper banners for this party. One had candy wrappers cut out and it hung from the vanity in the treat bar set up. 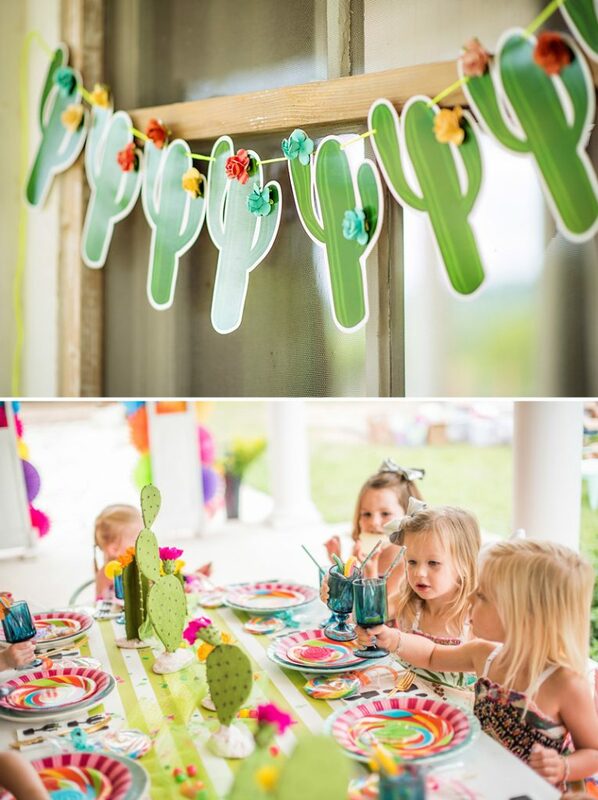 The other banner was in the shape of cacti, and we added flower embellishments for a 3-D effect. The girls were able to spend time eating sweets, giggling on velvet furniture, and even played a game of pin the flower on the cactus. Their parting gifts were favor bags filled with more treats. Each bag had a hand cut cacti and a hand lettered tag. We embellished each tag with little candy pieces, again making each one unique. Inside was a smorgasbord of lollipops, candy gumdrops, birthday cake bubble gum, lip-gloss in an ice cream cone, bubbles, and the best part is the gumdrop & rock candy shaped soap that looks so real you want to eat it! 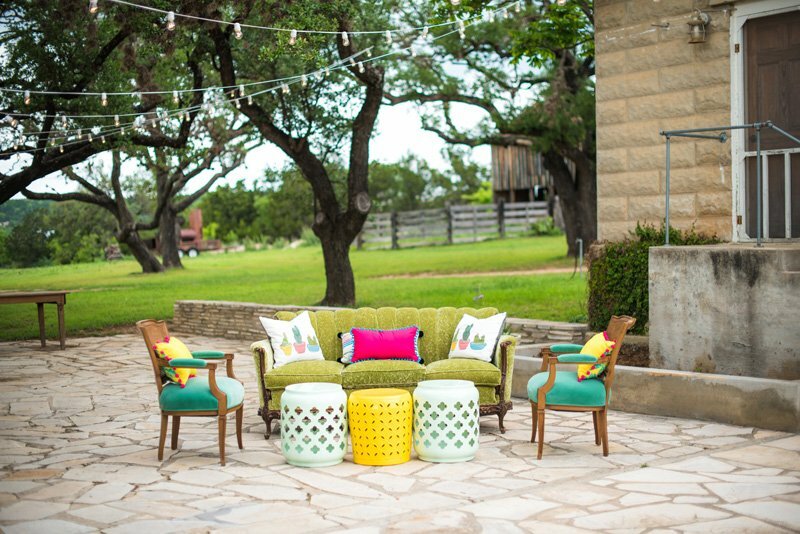 The Grove House was such a treat to utilize for our Cacti & Candy Summer Soiree. The open airy porch is something dreams are made of, accented with the massive white columns and historic wooden architectural elements. 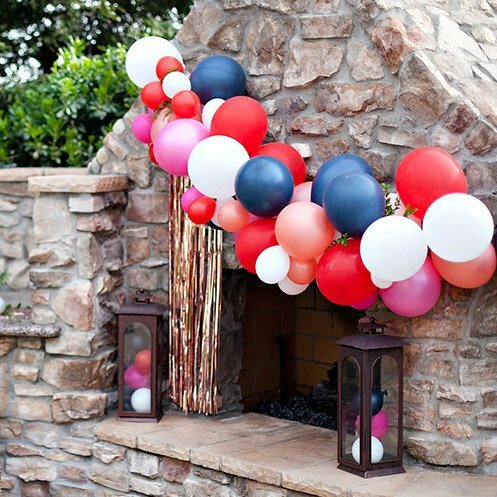 The courtyard is a perfect gathering spot events, and the white/neutral elements create a versatile canvas for an array of decorating styles. Very well done party. Everything looks so colorful and vibrant. Would love to feature this party on paarteez.com. 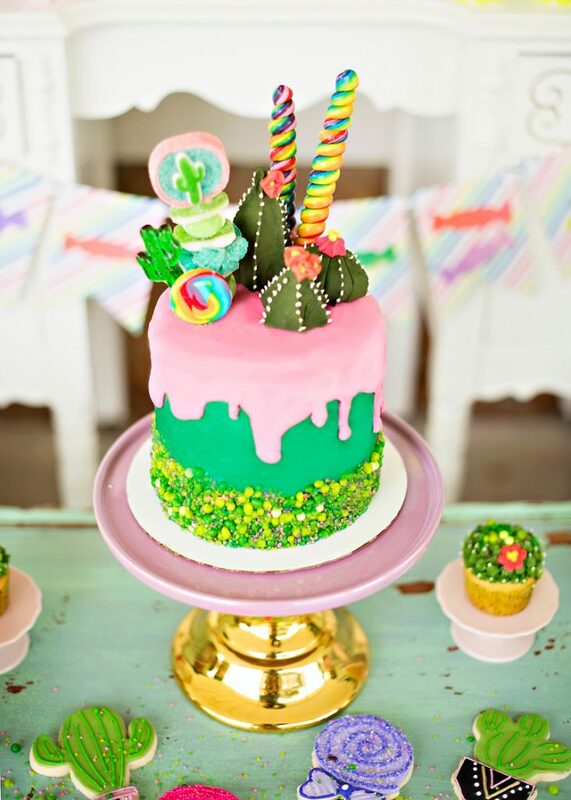 The combination of Cactus and candy for birthday parties are seriously the most unconventional and unique idea to tap on. As seen here in this blog, a whole different look is coming out of it. This theme can excite the little ones and give them a reason to rejoice to witness something as bizarrely wonderful as this. 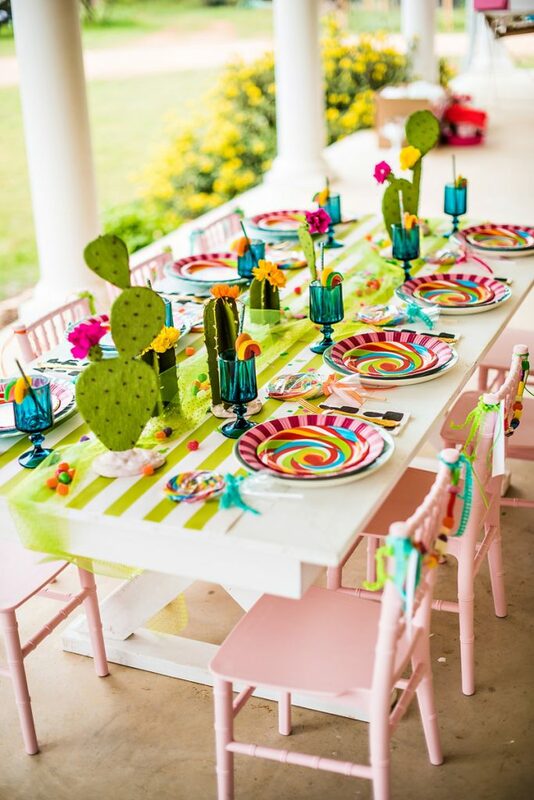 A unique party table with an equally inimitable fashion and deserts along with activities can surely exude a beautiful feel.